Bitdefender for Windows XP - a popular program that allows you to eliminate viruses and malicious software in real time. It provides cloud storage for backing up and restoring personal documents. The utility scans traffic, offers constant active virus control and proactive protection. It blocks online threats, phishing, spyware and suspicious files and components. The product has a simple interface that allows you to quickly understand a wide range of working tools, functions, sections. 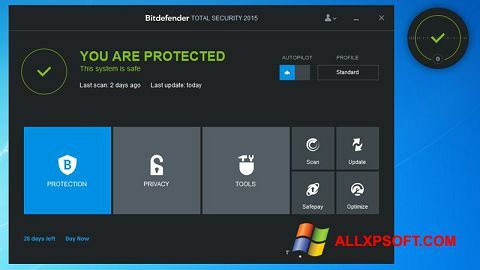 You can free download Bitdefender official latest version for Windows XP in English.